The good news for the Washington Redskins is that the team is in first place in the NFC East. 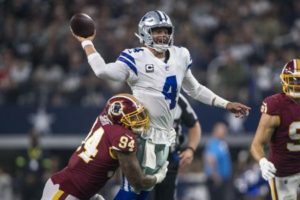 The bad news for the Redskins is that with their loss to the Dallas Cowboys on Thanksgiving they are tied with the Redskins for first place. 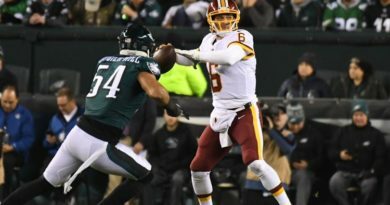 The ugly news is that the Philadelphia Eagles came back from a 19-3 deficit to defeat the New York Giants 25-22 and are a game behind both the Redskins and Cowboys for the division lead. All of this will lead to drama over the final five games of the season as the three teams battle it out for the division title. Let’s take a final look back at the game from Thanksgiving. The Tight Ends- Vernon Davis had a bounce back game and Jordan Reed had another solid performance. The duo combined for eight receptions for 148 yards and a touchdown on 23 targets. Reed consistently moved the chains on third downs while Davis had the deep touchdown reception. These two are some of our best weapons offensively and will need to be utilized going forward. Trey Quinn Affect- Seventh round draft pick Trey Quinn showed his value to the team in two phases of the game. In one sequence Quinn had a 30 yard punt return that set the Redskins up deep in Cowboy territory. Quinn then proceeded to catch a ten yard touchdown pass to give the Redskins the lead. Quinn is giving the team what has been missing since his and Jamison Crowder’s injury, a consistent slot receiver. Colt McCoy Good- Colt McCoy had some really good moments in the game. McCoy’s best attribute was his mobility and his extending of plays. There were a few third downs where McCoy extended plays to convert third downs. McCoy will get better with more practice with the starters. Run Defense- Run defense is not just a defensive line or just a front seven problem. Against the Cowboys all three levels had their miscues in the run game. Defensive lineman were either double teamed or forced the wrong way, linebackers filled the wrong holes, and defensive backs to bad angles to try and tackle the ball carrier. This combination allowed Ezekiel Elliott to become the first running back to gain 100 yards on the ground. This has to be corrected quickly. Turnovers- One of Alex Smith’s best qualities was his ability to take care of the football. Colt McCoy has been known as more of a gunslinger and that became evident in this game. McCoy threw three interceptions and had a fumble that was recovered by the Redskins. The first interception was a really bad decision by McCoy while the last one came at an inopportune time. If McCoy can slow these turnovers down his aggressiveness will pay dividends for the offense in the long run. Primetime- The Redskins have been notoriously bad on primetime and feature games over the past 20 years. Thanksgiving is one of those marquee games where the Redskins have only defeated the Cowboys once back in 2012. These performances are embarrassing to the players and the fans as the team looks consistently unprepared or unmotivated to play. In two primetime game the Redskins are 0-2 on the season and their next game is on Monday Night Football. Pass Defense- The secondary of the Redskins had an ugly game. For the most part they were in position giving up small plays here and there. The two back breaking touchdowns from Amari Cooper were results of bad technique and horrible angles. On the first one right after the offense just took the lead, the Cowboy offense had driven to midfield. On a third down Cooper ran a delay route and Quinton Dunbar slipped followed by Ha Ha Clinton-Dix took a horrible angle and instead of a fourth down attempt for the Cowboys, it was a touchdown. On the second one Fabian Moreau was behind Cooper but had a play on the ball. Moreau missed the ball and Clinton-Dix played where the ball should have been instead of where it was, and the result was another long touchdown. The defense was so close to getting off the field, take those plays away and the Redskins win. Tackling- The back breaking touchdown was a play where Jonathan Allen came free on a rush on Dak Prescott. Prescott was able to elude Allen, made Preston Smith miss, and make a few more moves on his way to the end zone. If the defense gets that sack and forces the field goal, the Cowboys would have only had 27 and a closer game at the end. 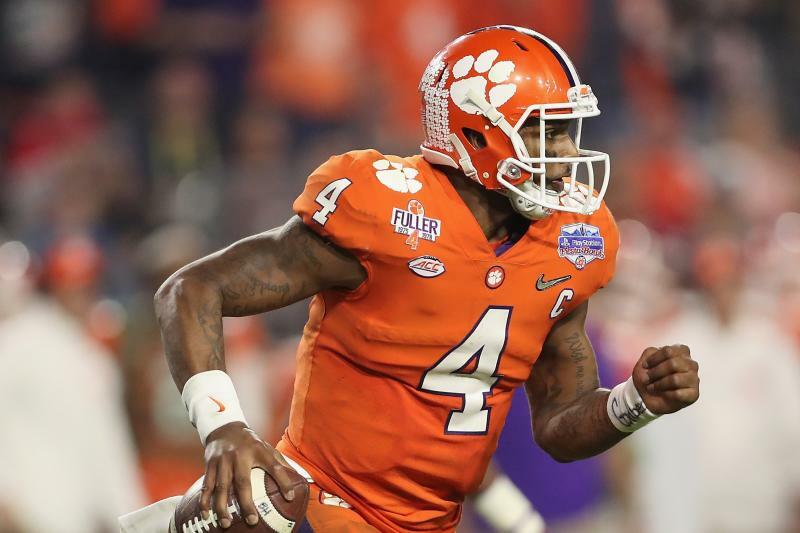 There were a few other instances where runners gained extra yards. Tackling must improve going forward. Injuries- Trent Williams went to the hospital after the game to be checked for a rib injury and possible kidney damage. Williams was fine and should be expected to play next week. Linebacker Cassanova McKinzy tore his pectoral muscle and is expected to miss the remainder of the season. Corner back Quinton Dunbar looked hobbled during the game as well. 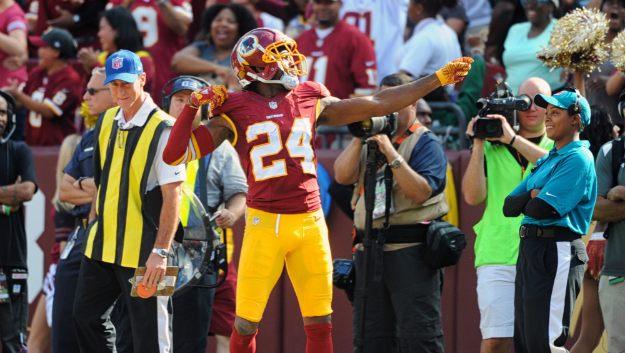 Chris Thompson looks to return would would be a tremendous asset for the offense.